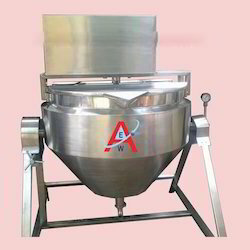 Pioneers in the industry, we offer stainless steel kettle, double jacketed paste kettle, jacketed insulation paste kettle with agitator, jacketed paste kettle, paste kettle and ss paste kettle from India. Hemispherical design for proper mixing of paste Jacket for heating element as a part of kettle External jacket for Insulation as an option Heating element via steam ( Provided by customer) Discharge from bottom via butter fly valve Inside mirror finish Driven via motor & gear box assembly mounted on top Discharge of paste Via. Bottom from butter fly valve Anchor type impeller design for proper mixing of paste 75% closed & 25 % open top cover deign with proper locking All the contact part from SS-316 All the non contact part from SS- 304 Main pillar of Kettle will be from SS 304 Operating panel will be fixed on pillar Insulation jacket on Steam Jacket Flame Proof Construction. Standard models range from 30 Ltrs to 3000 Ltrs. Starch Paste Kettle will be made out of S.S. 304 Rectangular Pipes and will be an independent resting type frame work where no foundation will be required. The Kettle will be a hemispherical type bowl with either steam / Oil / Water heating Jacket will be provided. The Kettle will be manufactured from 2.5 mm thick S.S. 304 Sheet and The Jacket will be of 2.5 mm Mild Steel (In case of steam Jacket the thickness will be 4 mm) There will be oil / water heated fitted at the back bottom side of the Kettle. The Kettle Will be having a worm type arrangement for tilting. A temperature controller & a temp Indicator will be provided for temp control & Indication. The Kettle will be Insulated with 50 Mm thick glass wool Insulation & Claded with 16 Swg S.S. 304 Sheet. Starch Paste Kettle will be buffed to 150 grit matt finishes externally and Internally the Kettle will be buffed to 220 grit mirror finish. 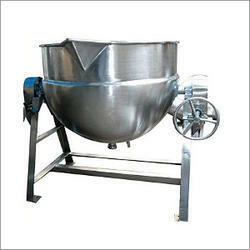 Our Starch Paste Kettle is available From 30 Ltrs to 2000 Ltrs Capacity. We Also Manufacturer Capacity 3000 Ltrs & Above. With our expertise in this domain, we are able to offer a superior quality range of Jacketed Insulation Paste Kettle with Agitator. Designed at par with international quality standards, all our products are manufactured using high-grade material and quality components that are sourced from the trusted vendors of the market. Also, these products are checked by expert quality controllers on various parameters to ensure flawlessness. 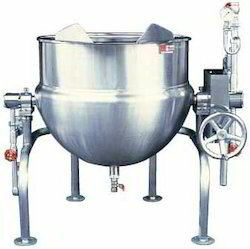 Clients can avail from us a vast assortment of Jacketed Paste Kettles. All our products are designed and manufactured using quality components that are sourced from the authorized vendors of the market. Furthermore, we provide timely delivery of these kettles at clients’ end within the committed time frame. 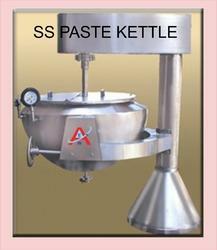 Our Starch Paste Kettle is available From 10 Ltrs to 2000 Ltrs Capacity. CGMP construction with AISI 316Q contact parts. 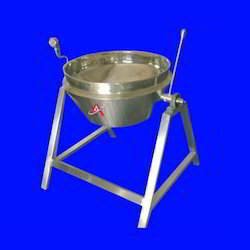 Hemispherical bowl with either steam, electrical or oil heating options. Options available for with / without agitator. Tilting provided for ease in unloading of final products. Higher capacity models available without tilting but with bottom outlet. Capacities available from 10 Ltrs. To 5000 Ltrs. 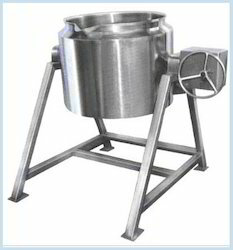 Starch Paste Kettle s used for preparation of Starch Paste. Hemispherical shape ensures that the Heating of the Starch Paste is Uniform & gets more surface area. The tilting type arrangement ensures ease in unloading the paste into any container or vessel. The Starch Is put in the kettle and water is added till desired thickness is achieved. 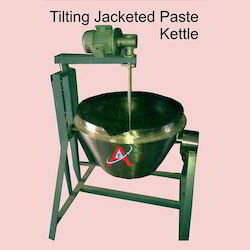 The Kettle is jacketed & is heated till the starch melts a thick paste is achieved. This paste can be agitated either manually or with The help of A Anchor type agitator which will constantly stir. The Paste with no lumps formation and proper mixing is achieved. Temperature can be set to desired temp by adjusting the temperature on digital temperature controller. 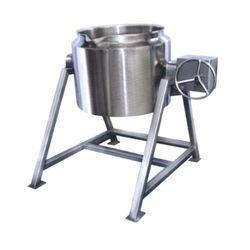 With the extensive knowledge and experience in this respective domain we are engaged in offering high quality Paste Kettle. 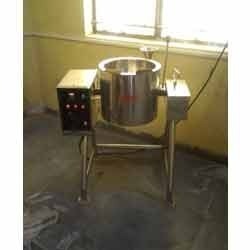 Ideal for making paste of different materials, this kettle is extensively used in pharmaceutical, chemical, food processing and many more industries. This kettle is manufactured at our production unit by using well tested components and hi-tech technology. Moreover, we provide this kettle in various specifications at market leading prices. Available size 30 ltrs to 2000 Ltrs. Capacities available from 30 Ltrs. To 5000 Ltrs. Non Tilting type with bottom discharge models is also available. 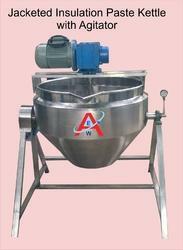 Our Starch Paste Kettle is available From 30 Ltrs to 3000 Ltrs Capacity. • DurableCGMP construction with AISI 316Q contact parts.• Hemispherical bowl with either steam, electrical or oil heating options. • Options available for with / without agitator. • Tilting provided for ease in unloading of final products. • Higher capacity models available without tilting but with bottom outlet. • Capacities available from 10 Ltrs. To 5000 Ltrs. Looking for “Starch Paste Kettle”?